Visit us on the 19th RETTmobil in Fulda/GERMANY from 15 till 17 Mai 2019: Hall L Stand No. 1711! We look forward to welcome you! for the measurement of alpha, beta and gamma radiation. Do you need a 6th sense? Here you will find the right "Geiger counter"! 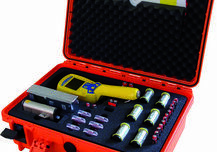 GRAETZ, your partner for radiation measuring technology.